We are glad to welcome you on our website. 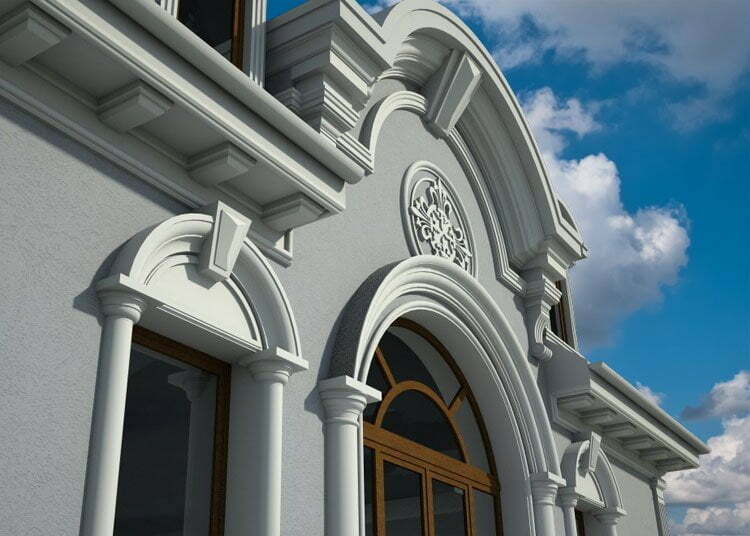 At us you will find answers to all the questions connected with decorating the facade of your house with architectural elements from reinforced polystyrene foam polystyrene. We are manufacturers of façade decor from foam for more than 10 years. The foam plastic used by us has the maximum density produced in our market. As a protective layer, we use special acrylic adhesive for machine application. The thickness of the protective layer is 3-5 mm. The ideal smoothness of the surface and the geometry of the product are guaranteed by us. The products are completely ready for installation on the facade and painting. We have been dealing with this type of foam products for more than 10 years – since 2004. We have extensive experience and practice in the design, manufacture and installation of facade decoration from reinforced polystyrene foam. Products offered by us for decoration of the facade are made by thermo cutting from foam plastic EPS with subsequent application of polymer-cement acrylic protective layer by machine method. The thickness of the protective layer is 3-5 mm, the color is light gray. We use the best foam available on the market. As a protective layer, a specially developed acrylic adhesive mixture is used for machine application on a shaped surface. We create the ideal geometry of any section. Facade elements due to acrylic protective coating are elastic in a very wide range. Elasticity of facade elements is an obligatory quality to prevent cracking and destruction under the influence of the environment. This property is the most important difference from similar protective coatings based on mineral adhesives. Computer thermo cutting allows you to get the product with an accuracy of 1 mm, and with the machine application of the protective layer, the geometry with any surface complexity is completely preserved. Elements made with us are completely ready for installation. The protective coating is elastic in a very wide range. Any element can be in arched design. The reinforcement of the arched elements is made by the machine method. The length of molded products is 2 m. The length of arched elements is 1 m along the outer chord. “A man is met by the clothes, and escorted by the mind” is a proverb that can be fully applied to the facade of your house. The topic of inner content is not our theme, but external beauty, attractiveness, correctness of form, chic and to some extent wealth is what we can help you to do on the facade of your house. The facade decoration of reinforced polystyrene foam is the best solution for this. In the first moments, the human brain perceives the image as a whole. Beauty proportions of the body – the ratio of the area of ​​windows to the area of ​​the walls, the size of the roof, the height of the cap, the height and thickness of the columns. This impression remains the main one and it is difficult to change it with smaller details. Therefore, the first place in the design of the facade of the house is the task of correcting general disproportionate moments. For example, visual expansion of openings with window moldings, the top of the window, the window sill, the bracket, the lock stone – possible options are presented on the page ready-made solutions for the decoration of the facade of the house. Decrease or vice versa visual increase in the height of the house with the help of the appropriate design of the corners: rusts, pilasters, frame design, a combination of different elements. Depending on the removal of the roof, various roofing cornices are used in various proportions and sizes. General color solutions of human clothes – the facade of the house produce one of the main impressions. Therefore, it is necessary to carefully approach the issue of selecting the color and materials of walls, plinth, roofing, window frames, etc. Many years of experience in the design of the facade of the house is reflected on the page of our facade decoration projects. Now, when the overall picture of the appearance of a person – the facade of the house is stacked – you can pay attention to the smaller details. Headgear or the shape and color of the hairstyle is usually first and foremost striking: it is the material and color of the roof, the shape and dimensions of the crowning cornice, the color of the roofing. The eyes (windows) are the mirror of the soul. Small, narrow, disproportionate windows visually expand, lengthen or overestimate with the help of architectural elements. Shoes (the basement of the house) can be small, trampled and dirty, and can be elegant, comfortable and practical. Therefore, the correct choice of the facing material of the socle and its accentuation with elements of the architectural decor – facade decor play an important role in the architecture of the facade of your house. All our products are certified and time-tested. If you want to have a beautiful facade of a country house – appealing to us is the best choice. Our foam decor for the facade of the house is best suited for fulfilling your desires for the design of the house from the outside. In comparison with the facade of the house made of foam plastic made by hand (manually), our architectural products will give you only positive emotions and will not bring disappointment about the wasted money. Having viewed the photos of our works on the pages of PROJECTS and WORKS you can easily determine the preferences, the general direction of the design of the facade of the house, the choice of specific architectural elements of the facade for the decoration of the facade of your house. Examples – photos, a photo gallery on these pages will show you how beautiful the facade can have your country house. Do you doubt whether your building needs a facade decoration? Kiev is replete with samples of “music in stone” of different eras, styles and cost, illustrating the actuality of exterior design – there is much to see. Decor not only decorates, but also corrects errors in the proportions of architectural elements, visually changes the height of the building and the dimensions of the openings. If desired, you can compensate the cornices for the removal of the roof, decorate the facade frame and various combinations – for every taste. The pillars look too thin? In our catalog there are variants of capitals, elements for changing the base and the general form. If the basic configuration of materials does not work, our designers will carry out an individual project, and exclusive it will be down to small details. Would you like to consult with other real estate owners before choosing a facade project, see a three-dimensional virtual model, try on different design options? We also have a library of decorative elements in addition to the catalog, and in different formats and with drawings – you can download for free, the interface is convenient for users of different levels. Decoration of the building with a facade decoration is a great way to visually transform it, highlighting all the successful elements of architecture and disguising the nuances that negatively affect the overall impression of the building. Thanks to the use of certain types of decor, you can turn a building of any type, including a dwelling house, into an original structure, just adding its facade with several unusual elements. One of the main details of the finish are the crown molding. They are widely used for finishing the joints, spoiling the appearance of the building, dividing the wall into zones, focusing on certain areas of the structure. Since the cornice is a ledge on the wall, it can also serve as additional protection of the building against atmospheric precipitation. The material for its production is different raw materials: gypsum, polymer concrete or foam. The latter has a number of advantages, therefore decorative elements from it favorably differ from those in which other materials are used. 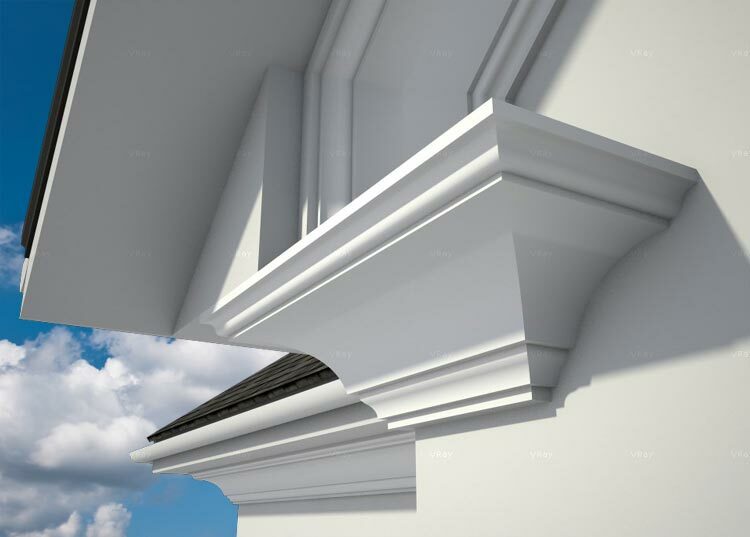 Crown moldings – a detail of the facade decoration, which is usually very large (due to the length) and is located around the perimeter of the building, so its production of foam has its advantages. Lightness of the material, which allows securely fixing all the details, which prevents separation from the wall or collapse of the structure. No load on the building, even if the building is many years old, such a decor can not hurt it, unlike products made of heavy materials, it will not contribute to the appearance of cracks in the walls. The price for such a cornice is lower than the cost of a similar element of gypsum or polymer concrete. Decoration of house facades is a known way to make it aesthetically attractive. For this, different methods are used, from classical decorative plaster to siding panels of different colors. But recently one more method is gaining popularity – decoration of facades with moldings made of polyurethane. 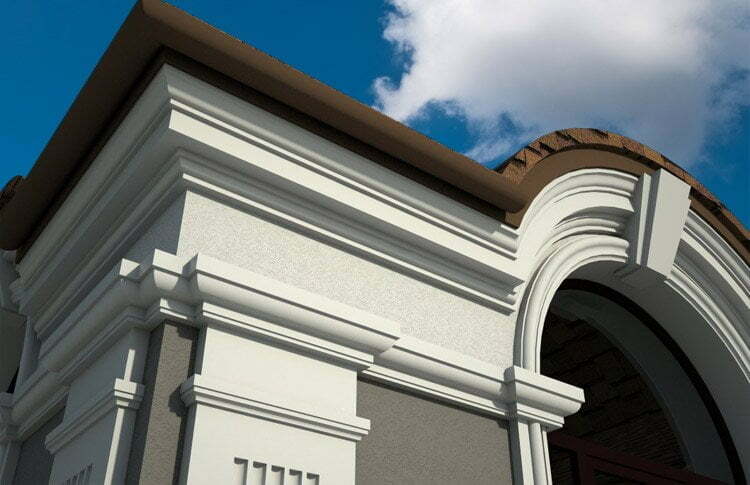 The first indisputable advantage of stucco from polyurethane is its moisture resistance. Accordingly, the durability of the material increases, and as a result, the entire facade. Installation is carried out with the help of a special technique of “liquid nails”. Sometimes such material “upholstered” not only the facade structures, but also the internal walls of the premises. Another advantage – the ability to paint polyurethane stucco in different colors, which creates freedom in the aesthetic design of the building. Used for this mainly moisture resistant paint. Due to their wear-resistant characteristics, polyurethane facades outperform most known “upholstery” materials – concrete, wood, gypsum. Not surprisingly, almost all manufacturers give an impressive guarantee – a minimum of 20-25 years. Polyurethane has an important installation quality: in the liquid state, it is optimally fluid, which contributes to a more comfortable decoration. From such a “liquid” you can create any architectural forms. The user gets great advantages of installation in comparison with alternative materials. In fact, all you need for an “architect” is a balloon with liquid nails, a broom, a brush and water. “plates” of two meters greatly speed up the installation process. In addition, the material is not prone to chips and damage during transportation. Therefore, its transportation – the most convenient, comfortable and safe. Moldings of gypsum or polyurethane? But still there is a big dilemma – to trust a proven gypsum or use still not so popular in Ukraine material. Here an unambiguous answer to the question does not work. Despite all the above advantages, polyurethane in some parameters is inferior to gypsum. For example, in that stucco from gypsum is a hand-made material, and the first is made by machine-tool method. Particularly ardent fans of handmade it can repel. But the advantage of polyurethane molding is lower assembly costs (and, interestingly, the material itself is more expensive than gypsum, but in the process of installation, gypsum requires large investments). Choose – you. But in general, stucco from polyurethane can be a good alternative to gypsum – it is more economical, easier to install and has excellent characteristics of wear resistance and aesthetics. The most characteristic part of the house, in terms of architectural decoration, is the corner of the house. In this part of the building you can see all, or almost all, elements of facade molding. The overhang of the roof is decorated with a large or small, complex or simple, single or composite under roof cornice. Slightly lower can pass an additional dividing strip on the facade, which allows to carry out the color zoning of the facade of the house. The corner of the house itself is designed with a variety of options in order to visually reduce or increase the height of the structure. Rusts, pilasters, combined variants are the main types of facade decor of the corner of the house. A separate and most basic part of the decoration of the exterior walls of the house is the facade decoration of the window. The main task in the decoration of the window opening is also the alignment of the general proportions of the building due to the decor. More detailed and detailed about the design of the slopes of windows you can see on a separate page of our site. A very important part of the facade decoration is the interstorey, dividing strip. With the help of this element of decoration, it is easy to solve the problem of dividing various materials for finishing the walls of the facade of the house. Also with the help of interstorey molding we visually reduce the not always proportional height of the house. And the final step in the set of facade decoration of the walls of a private house is the socle strip. This element is primarily a logical separator between the basement part of the structure and the main wall. In the same way, the socle profile can perform technical functions – smoothing the difference between the projections of the wall and the cap, drip pipe, etc. Below are a few examples of finishing the facade decoration on the corner of the house. In this example of the decoration of the facade of a country house, the under roof cornice consists of two separate elements forming a massive filling. The corners of the house are decorated with rustic stones with a bevel. Rusts on the corner between each other do not fit together, and everyone is mounted on their side. The windows of the second floor are framed by a 12 cm wide molding along the wall. The top of the window is supplemented with a profile with angled pruning, as well as a locking stone. On the windows of the first floor, in addition to molding, a decorative window profile is applied. In this case, a double inter-floor partition of the facade is applied. One strip goes along the line of the second floor window sills, and the other on the slab of the first and second floors. This technique helps to significantly underestimate the visual height of the building. Between the dividing strips, decorative frames with a thin facade profile are applied. The socle element is arranged with a thin part upwards to smooth out the thickness difference between the plinth and the main wall. The main decoration of the walls is a bark beetle or decorative plaster. It is applied the final coating of the walls after the installation of decorative stucco. This helps to further isolate the joint of decorating the elements to the wall. The basement is decorated with marble or granite. On this fragment of the architectural decoration of the facade of the private house, the under-roof space is also filled with a combination of two separate stucco elements. The height of the composition is greater than its flight over the roof, which gives a strong effect that underestimates the overall height of the house. In this set of facade decoration of a private house, the roof overhang is also decorated with a combination of two separate stucco elements. The height and reach of the kit are almost the same, which gives a full and deep filling of this part of the facade of the house. The windows of the second and first floors are decorated with a simple set of molding and a window sill with the use of a castle stone. The corners of the house are decorated with rustles of different sizes of simple rectangular shape without bevel. Such a variant of rusts is usually mounted from molded products. The inter-storey division is made using two types of small profiles located at a distance from each other. The gap between them is painted in the color of the decor, due to which we get a wide separation on the facade. In this set of facade decoration of a private house, the roof overhang is also decorated with a combination of two separate stucco elements. The cross-section of the elements has more bends and steps than the previous version. The windows of the second and first floors are decorated with a large molding around the perimeter. The cross-section of the molding has a pronounced, convex, rounded shape. The top of the window is mounted at a distance from the molding and is supported by decorative brackets. The corners of the house are decorated with pilasters of relatively small width along the facade. Each element is located a short distance from the corner of the house. In the interstorey division two separate elements are applied between which there is a band of architectural ornament. The upper dividing strip passes along the bottom of the windows of the second floor. The lower strip passes along the interlayer slab. To the composition of the basement of the house can be carried, in this case, and the strip passing through the bottom of the windows of the first floor. This option looks good in the presence of so-called French windows – when the bottom of the windows is located not high from the floor. The socle element is arranged with a thin part upwards to smooth out the thickness difference between the plinth and the main wall. This set of architectural stucco elements can be characterized as more complicated in geometry, with elements of decor. The methods of circumventing additional thicknesses are used to create a larger relief and volume. The windows of the second floor are framed by a wide relief molding 18 cm wide. Additional profiles were created from the window profile under the 45 degree incisions, under the moldings imitating the brackets. The top of the window also has a complex relief due to undercutting at an angle. The castle stone is embedded in the profile part of the top of the window. The corners of the house are decorated with rustles of a simple rectangular shape of the same size. Such execution is usually performed by the performers of the facade works in the place or from the molded product. Between the floors a volumetric, projecting dividing strip is launched. The size and volume of it create an additional relief on the facade of the house. The main decoration of the walls is a bark beetle or decorative plaster. It is applied the final coating of the walls after the installation of decorative stucco. This helps to further isolate the joint of decorating the elements to the wall. The first floor is made with a cut-off. This type of decoration is done by facade workers when the walls are insulated. In the heater are made grooves, which are then reinforced with the corners together with the main wall. The basement is decorated with marble or granite. In this case, the main distinguishing feature of this composition is a massive, three-dimensional frame of windows. Roof cornice is made of two separate elements. mounted at a distance from each other. The gap between the upper. the main cornice and a smaller half on the wall are painted in the color of the decor, which visually gives a single composition. The windows of the first and second floors are decorated with a small molding around the perimeter. And from it a figured frame is created in which the brackets are inscribed. On the first floor, a straight top of a large profile window is added. In addition to it, there is an arched element on the second floor. 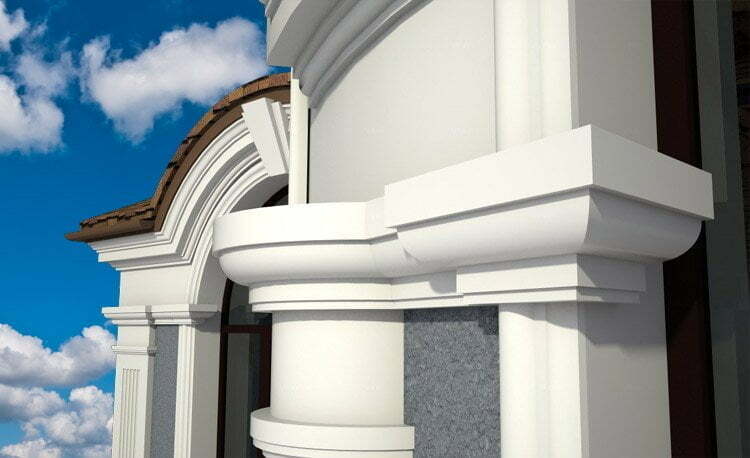 In modern times, taking into account the variety of finishing materials for repair in the premises and materials for the decoration of facade elements of houses, it is possible to create any masterpieces with various decorative elements made of polystyrene foam. Such products include stucco molding, cornices, columns, rusts, locks, window sills and much more. Our company offers products from foam plastic for creation of refined and decorative elements not only in an interior, but also in registration of facades of buildings. On our site there is a catalog of decor in which any consumer can find beautiful decorative elements for any facade. There are a variety of facade columns, stucco molding, window sills, cornices and much more. It is very important to create on the facade of the house a nice looking picture that matches the tastes and preferences of its owner. Our catalog of facade decoration will help in choosing the most exquisite and beautiful decorative elements. Design such elements can be any part of the facade of the house: windows, window sills, doors, corners and much more. The material is resistant to different temperature conditions. Foam moldings made of foam material are durable. By weight, such products are light enough. The material does not undergo combustion, it is self-extinguishing in case of unforeseen circumstances. There is no ability to fade and yellow, the products retain their original appearance for many years. Can be used in any design. Designers are increasingly trying to apply stucco molding. This is due to the fact that its elegant lines, refined style and accessibility are very attractive to purchase. Stucco molding of foam with special coating for painting is on sale. Such decorative elements are easy to install, you can even do it yourself without any special tools. Thanks to stucco molding, you can decorate the exterior without much expense on decorative elements. He will give a unique image and individuality to the room. A wide application of stucco decoration was obtained in the framing of the facades of buildings and houses. Due to the ease of the material, you can create any design that will give the individuality to the home. The products of their polystyrene foam of our company have long been recognized among buyers, because only quality products are on sale. The catalog of the facade decoration from ArtFasad will amaze with its variety of choice of decorative elements made of foam plastic material. 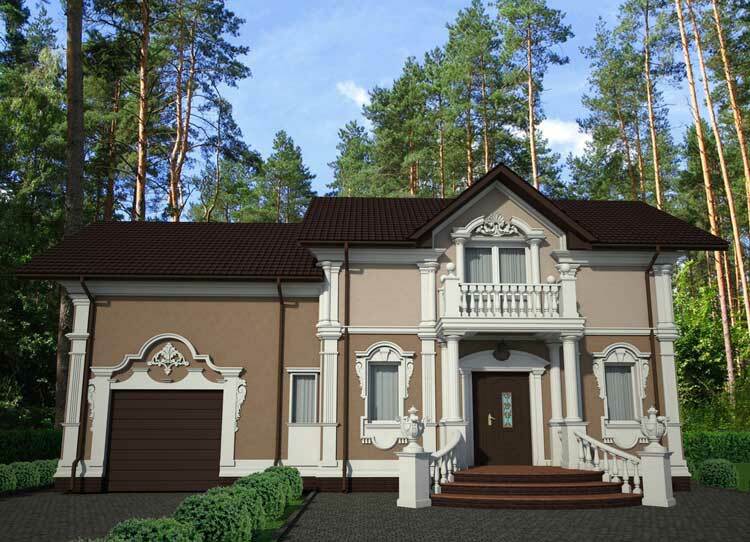 Create a beautiful facade of your country house, and our products will help in this. 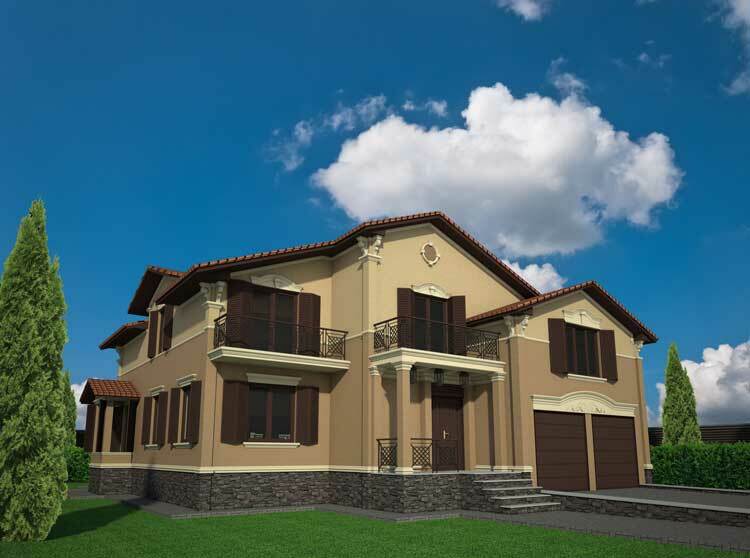 Treat yourself and your house with an elegant stucco decoration that will embody an unforgettable view and bring a touch of elegance and luxury!